[Image: A “Cavern Breathing Unit” from Subterranean Singapore by Finbarr Fallon, Bartlett School of Architecture, Unit 24]. Here is another project from my reviews the other week at the Bartlett School of Architecture; this one is called Subterranean Singapore, and it is by Finbarr Fallon, produced for Unit 24, which is taught by Penelope Haralambidou, Simon Kennedy, and Michael Tite. 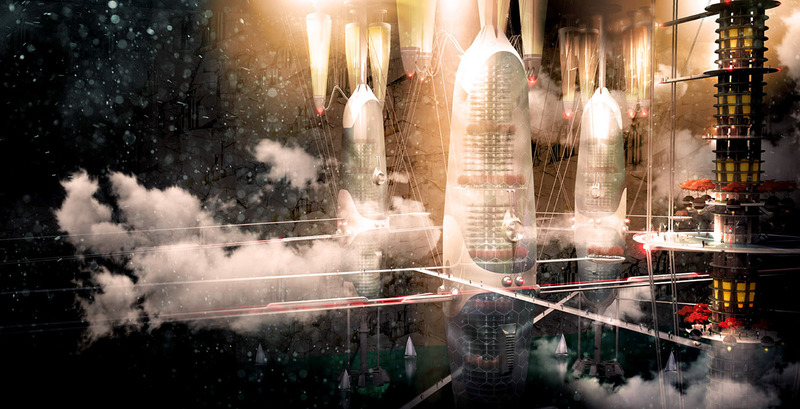 [Image: “Concept Breathing Towers” from Subterranean Singapore by Finbarr Fallon, Bartlett School of Architecture, Unit 24]. 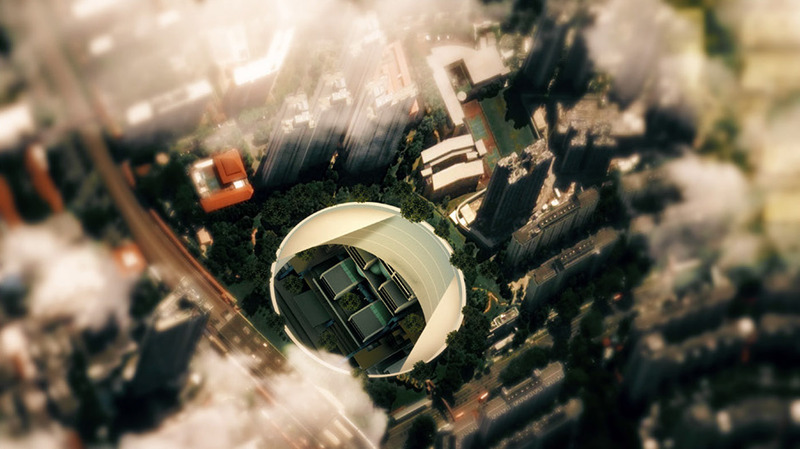 Subterranean Singapore is presented as a speculative look at massive underground residential development in the city-state of Singapore over the next few decades. 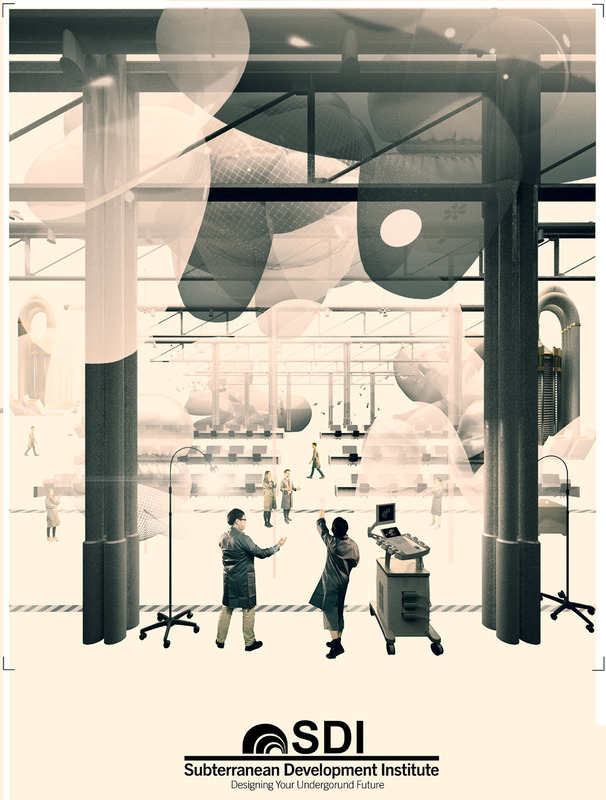 [Images: Glimpses of a “high grade recreational space within an inflatable cave unit,” from Subterranean Singapore by Finbarr Fallon, Bartlett School of Architecture, Unit 24]. The city has run out of room to expand into the sea, and is thus forced to look downward, into the depths of the continental shelf, excavating beneath the surface of the city and heading partially out below the seabed. [Image: From Subterranean Singapore by Finbarr Fallon, Bartlett School of Architecture, Unit 24]. [Image: The “Subterranean Development Institute: Designing Your Underground Future,” from Subterranean Singapore by Finbarr Fallon, Bartlett School of Architecture, Unit 24]. The construction process is kicked off with great imperial fanfare, involving a parade of excavation machines and robot carving arms marching their way forward through clouds of confetti. There is even a celebratory pamphlet. [Images: From Subterranean Singapore by Finbarr Fallon, Bartlett School of Architecture, Unit 24]. The idea is not entirely science fiction, of course: Singapore is already excavating huge oil-storage facilities underground, and nearby Hong Kong is actively experimenting with the design and implementation of entire underground infrastructural zones. For Fallon, however, such a proposal cannot be divorced from the question of who will be able to afford these spaces of underground luxury—complete with fish ponds, spas, and the soothing presence of exotic mechanical animals meant to bring an ironic touch of the natural world to those below. [Image: A light-well looking down at Subterranean Singapore by Finbarr Fallon, Bartlett School of Architecture, Unit 24]. Let alone, of course, the question of human labor. Who, after all, will physically construct these things? Whose backs will be broken? The accompanying film—in fact, the film is the core of the proposal—suggests that not everyone is pleased to see this triumphant underground utopia take root beneath Singapore, and hacker-saboteurs appear to take things into their own hands. While the plot itself is not unusually complex, many of the images successfully wed the cinematic and the architectural, and were worth posting here. 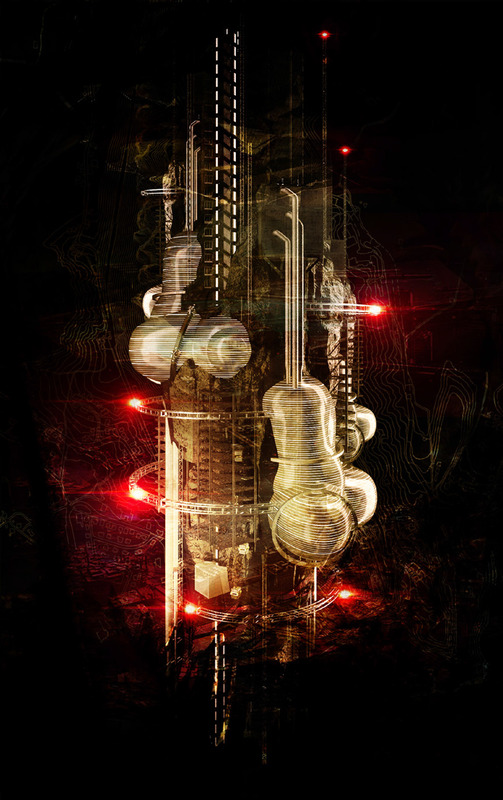 Keiichi Matsuda, a recent graduate from the Bartlett School of Architecture, whose film Domestic Robocop was featured on BLDGBLOG several months ago, has a new project out: Augmented City. And it’s in 3D. The architecture of the contemporary city is no longer simply about the physical space of buildings and landscape, more and more it is about the synthetic spaces created by the digital information that we collect, consume and organise; an immersive interface may become as much part of the world we inhabit as the buildings around us. Augmented Reality (AR) is an emerging technology defined by its ability to overlay physical space with information. It is part of a paradigm shift that succeeds Virtual Reality; instead of disembodied occupation of virtual worlds, the physical and virtual are seen together as a contiguous, layered and dynamic whole. It may lead to a world where media is indistinguishable from ‘reality’. The spatial organisation of data has important implications for architecture, as we re-evaluate the city as an immersive human-computer interface. The film is even better, Matsuda points out, with 3D glasses. Watch it here, over at Vimeo, or on YouTube. [Image: From “Labyrinths, Mazes and the Spaces Inbetween” by Sam McElhinney]. Sam McElhinney, a student at the Bartlett School of Architecture, has been building full-scale labyrinths in London and testing people’s spatial reactions to them. See photos of his constructions, below. McElhinney explained his research to BLDGBLOG in a recent email, attaching a paper that he delivered earlier this month at a cybernetics conference in Vienna, where it was awarded best paper. Called “Labyrinths, Mazes and the Spaces Inbetween,” it describes McElhinney’s fascinating look at how people actually walk through, use, and familiarize themselves with the internal spaces of buildings, using mazes and labyrinths as his control studies. In the process, McElhinney introduces us to movement-diagrams, Space Syntax, and other forms of architectural motion-analysis, asking: would a detailed study of user-behaviors help architects design more consistently interesting buildings, spaces that “might evoke,” he writes, “a sense of continual delight”? Pushing these questions a bit further, we might ask: should all our buildings be labyrinths? [Images: Movement-typologies from “Labyrinths, Mazes and the Spaces Inbetween” by Sam McElhinney]. Early in the paper, McElhinney differentiates between the two types of interior experiences—between mazes and labyrinths. A path system can be multicursal: a network of interconnecting routes, intended to disorient even the cunning. It may contain multiple branches and dead ends, specifically designed to confuse the occupant. This is a maze. Alternatively, a path can form a single, monocursal route. Once embarked upon, this may fold, twist and turn, but will remain a constant and ultimately reach a destination; this is a labyrinth. The experience of walking these two topologies is very different. How can architects design for this switch? [Images: From “Labyrinths, Mazes and the Spaces Inbetween” by Sam McElhinney]. McElhinney’s argument segues through a discussion of Alasdair Turner’s Space Syntax investigations (and the limitations thereof). He describes how Turner put together a series of automated test-runs through which he could track the in-labyrinth behavior of various “maze-agents”; these reprogrammable “agents” would continually seek new pathways through the twisty little passages around them—a spatial syntax of forward movement—and Turner took note of the results. Turner’s test-environments included, McElhinney explains, a maze that “was set to actively re-configure upon a door being opened, altering the maze control algorithms” behind the scenes, thus producing new route-seeking behavior in the maze-agents. The participants walked in and their routes warped the labyrinth around them. [Image: Sam McElhinney’s “switching labyrinth,” or psycho-cybernetic human navigational testing ground, constructed near Euston Station]. There can be a place or moment within any building, in other words, at which the spatially unfamiliar will erupt—and from movement-pathway studies we can extrapolate architectural form, buildings that perfectly rest at the cognitive flipping point between maze and labyrinth, familiar and disorienting, adventurous and strange. [Images: Sam McElhinney’s “switching labyrinth”]. The cybernetics of human memory and in-situ spatial decision-making processes provide a framework from which we can extract and assemble a new kind of architecture. How we move through coiled, labyrinthine environments can be studied for insights into human navigation, physiology, and more. McElhinney sent over a huge range of maze and labyrinth precedents that served as part of his research; some images from that research appear below. [Images: Maze-studies from “Labyrinths, Mazes and the Spaces Inbetween” by Sam McElhinney]. It’s fascinating research, and I would love to see it scaled way, way up, beyond a mere test-maze in a warehouse into something both multileveled and city-sized. Take a look—and you can find more thoughts, and another video, on Matsuda’s own blog.